One of the best ways to get our kids to eat healthy is to include a smoothie in the daily lineup (or smoothie pop — we freeze smoothies into smoothie popsicles and the kids eat them by the dozen). And let’s be honest, some days the grownups need another few servings of fruits and vegetables. We’ve tried different variations, but I think our trusted go-to is our berry spinach smoothie, although the tropical kale is pretty amazing! However, I think when we stick to the trusty usual every time, the kids reach a point where it’s no longer as popular. So, time to try some new combinations! 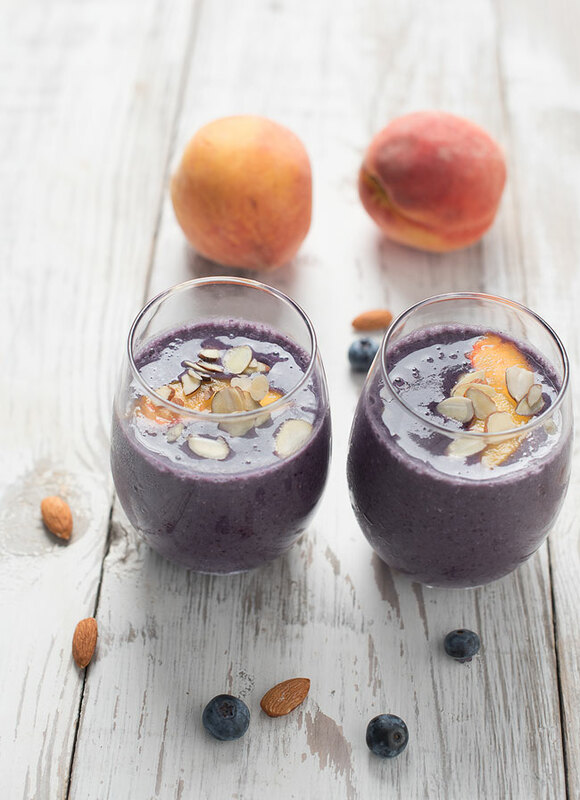 Today we’re making a Blueberry Peach Almond Milk Smoothie. We love fruit smoothies as do many families and individuals. And it’s not hard to figure out why! There are so many reasons to love smoothies, but we’ve composed our top 8 reasons for loving smoothies into the below infographic. 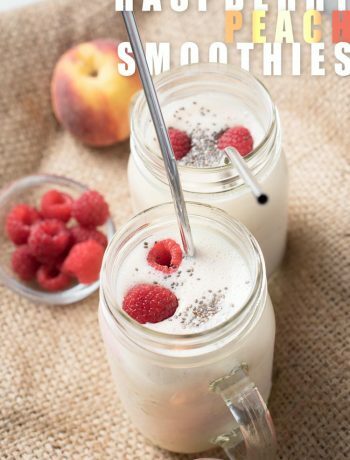 What’s your favorite reason for drinking smoothies and what’s your favorite kind of smoothie? Let us know in the comments below this post! 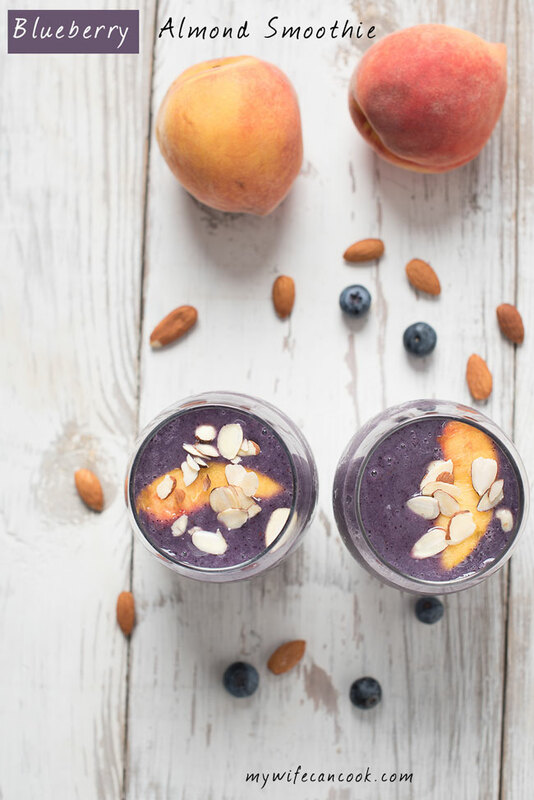 We love trying different flavor combinations when we make smoothies and we find that peach and blueberry are really a perfect match. 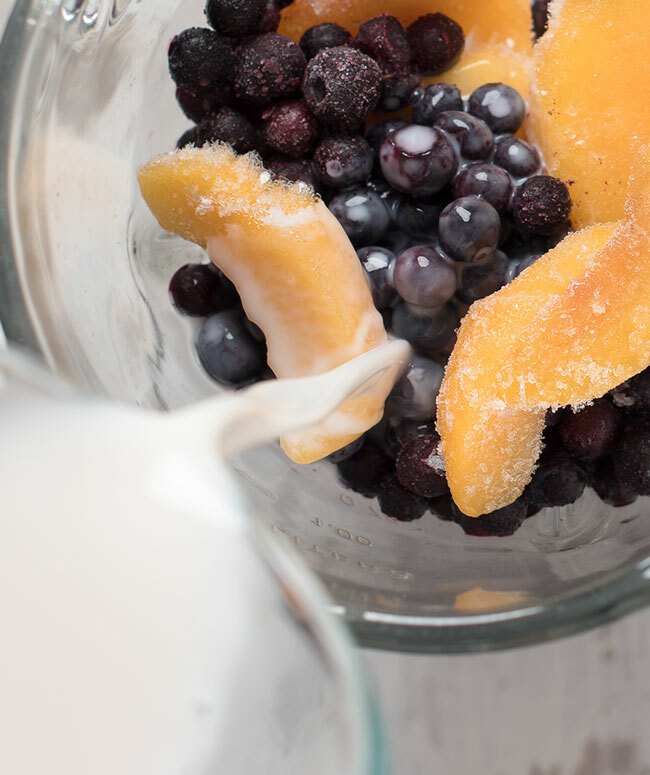 You can experience the magic of this flavor combo in our newest fruit crisp recipe, gluten free berry crisp and we’re back at it again with today’s Peach and Blueberry Almond Milk Smoothie. It’s the time of year when the summer clock seems to be running out. We’re trying to focus on enjoying every last minute of it rather than pining for fall weather, a return to routine, and fall. It’s the time of year when the summer clock seems to be running out. 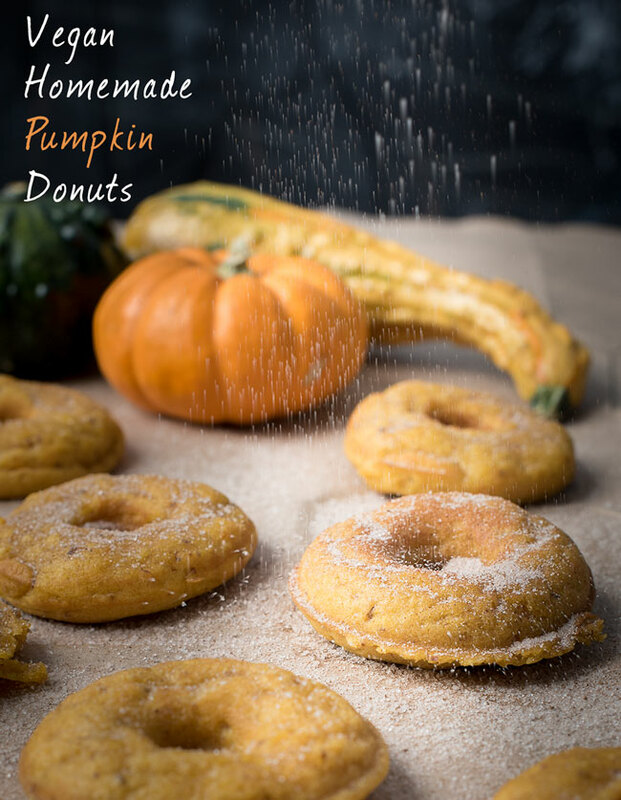 We’re trying to focus on enjoying every last minute of it rather than pining for fall weather, a return to routine, and fall produce (I love fall produce–apples, winter squash, etc.). So, in order to enjoy every last bit, we have ordered peach seconds from our local orchard and have blueberries in the freezer from the last of the fresh picked berries from a few weeks ago. 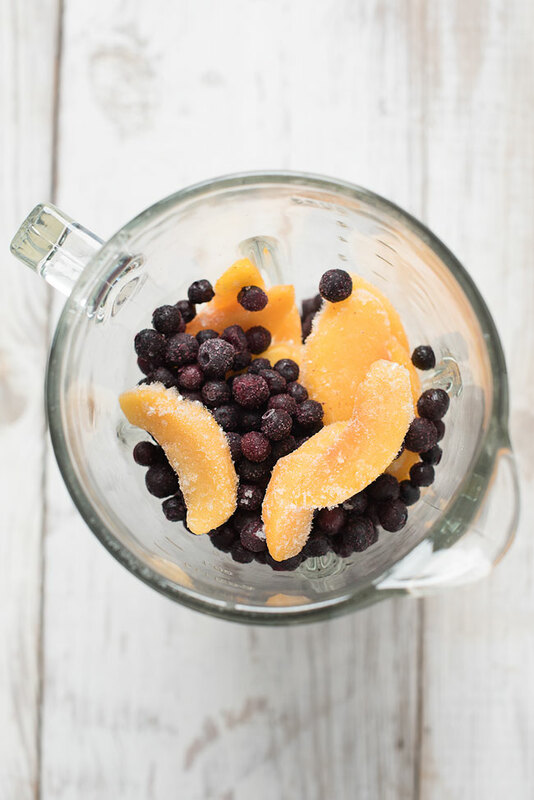 Both frozen and fresh fruit work great in smoothies, but having a frozen element really adds that cold element needed and can often take the place of adding ice. We’ve been on a few road trips this summer, some of them where I traveled solo with the kids to grandma’s house. I have really made use of the Panera rapid order menu and know where all the Panera locations are located along our route and which items on their menu will work well for us (always be prepared when traveling with kids!). We don’t get into the habit of eating out in normal everyday life, but I feel that on road trips, especially if you are the only one in the car over 10 years old, that it is a perfectly acceptable way to break up the trip. I end up packing all three kids a healthy lunch before we leave–sandwich, fruit, veggie, healthy snack or two, plus a junkier snack or candy item. They tend to power it down by 2 hours into the trip. And since we still have 5 hours to go, I’m ok with stopping for a treat. 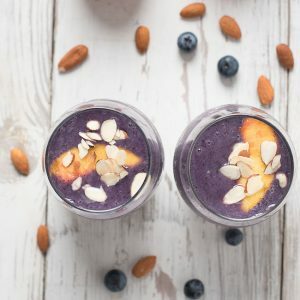 One of their favorite Panera items is a smoothie–frequently the peach blueberry almond milk smoothie. Not a bad choice, but I did look up the ingredients in it and it is a lot longer list than the normal homemade smoothie. 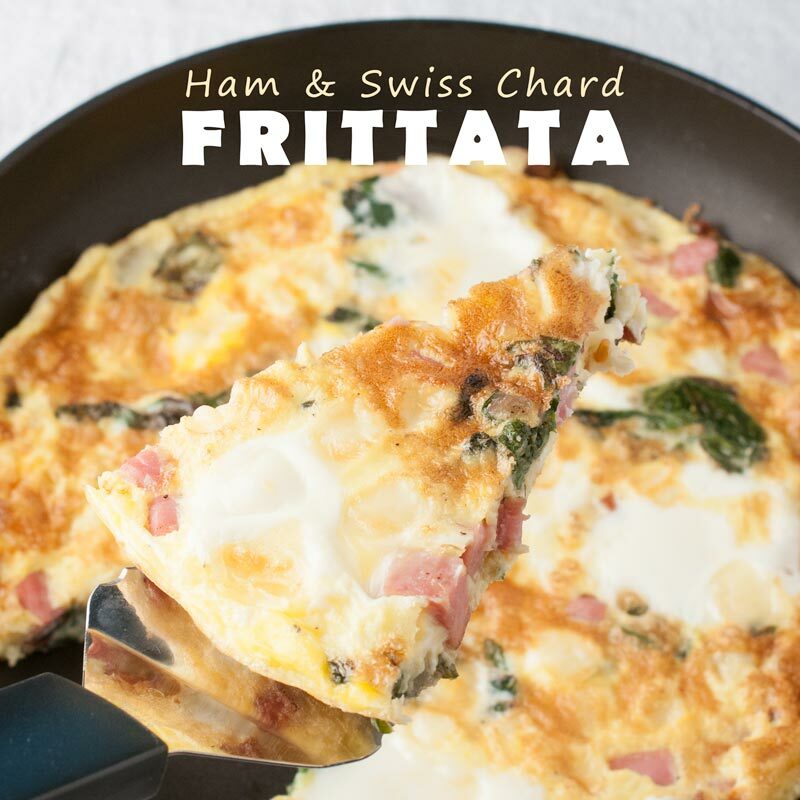 So, when we are back at home and want one, we whip up a homemade version. It’s just peaches, blueberries, almond milk, orange juice, and a banana. Sometimes, I even add a handful of kale (Shhh!). 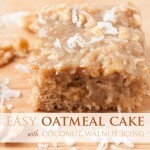 Or some oats to thicken it up. 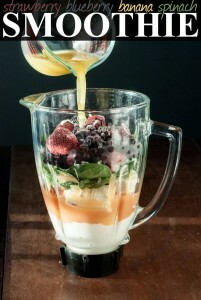 Our blender is on its last legs, so you may not need to add as much liquid as in the recipe. 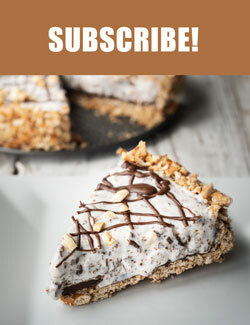 I tried making this with just almond milk, but my kids aren’t the biggest fan of the almond milk flavor. If you like the flavor, feel free to add just almond milk or a higher ratio of it to OJ. Put all ingredients in blender. I love smoothies in every way and this just makes me love them more. Thanks! We are huge smoothie fans! Thanks I am allergic to bananas. Can I substitute with something else? Or can I just leave the banana out of the recipe? You can definitely leave the banana out. 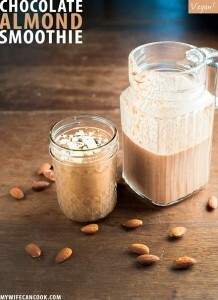 It will be a thinner smoothie, so you may want to add oats or greek yogurt to thicken (or reduce the liquid).